Was the Gathered Treasures show in Mansfield, Ohio and a good time was had by all!! This is my booth ~ we can really cram a lot of stuff in a 10' x 10' space!! It was such a nice show ~ very primitive antiques, home decor, garden accessories and a little bit of rug hooking! It was a fun day ~ I love doing shows but the old girl is tired for sure! After we set up yesterday, we went to our local homebuilders reverse raffle last night! At 10 o'clock I came home and left the kids in charge of the old guy ~ he got home 45 minutes after me ~ we'd had a long day!!!!! Tonite we went out to dinner with our friends Lou & Vivian, who did the show also. Came home, unloaded the truck and I'm doing laundry and packing for my trip to Pennsylvania tomorrow! Three of us who did the show and some other gals are heading to Barbara Carroll's for a 3-day class! Three days of non-stop hooking and eating great food!! I better pack the walking shoes!! Today, a gal who reads my blog, and knew that I was doing this show, brought in this antique rug to see if I knew what it was! She thought it was similar to rug hooking but it's really very different and another form of traditional craft. I believe it is 'shirring' ~ the strips of wool are stitched to a foundation fabric with a small running stitch down the middle of the strip ~ then both sides are brought to an upright position and another strip stitched right next to it. As strips are added they support each other and they form a type of pile ~ it is very interesting and the tag on it had a date of 1867 ~ it is in wonderful condition and the color is still very good. The rug is backed with what is now a pretty fragile fabric but only has one little hole it. The owner said she thought it came from a museum ~ whoever sold it to her was selling a lot of museum quality items at a garage sale ~ I think I have that right! I was really happy to have a look at it and think she has quite a find! Thank you for bringing it in, my nameless friend!! We had such fun neighbors across the aisle today ~ Rhonda and her friend, Stacie (both rug hookers) and Rhonda's mom and sister! So lively and kinda crazy ~ and the two rug hookers were great little shoppers!! Okay ~ I have to go to my bed now! I'll try to post when I return Wednesday night! Until then, Sonny boy and my sitter, Barb, are holding down the fort for me so I can be foot loose and fancy free for a couple of days! Have a great week!! Just a quick pic of some of the wool I dyed this week! These are the odds and ends that I throw in the pots and then price out as remnants. I really got some beautiful colors this time! I dyed for three days while I was doing billing and all the myriad of things that go on around here to keep us going! We just returned from setting up for the Gathered Treasures Show (link at the left) and now I must hustle my bustle and get ready to go to the HomeBuilders Reverse Raffle!!! I hope it's fun and hope we win the big pot ~ $1500 !!!! Now that would make for a fun evening! I'll take some pix of the show tomorrow and hopefully get them posted before I leave for Pennsylvania!! Most of the booths were set up and it's going to be a fabulous primitive show!! The mister is looking for me ~ ta ta for now!!! Last week, I hooked a couple of small mats for my upcoming show on Saturday. I love the way this finished ~ the sheep body is alpaca fleece from my friend, Reba, at Storybook Alpaca Farm ~ it's very soft and had a lot more body than I expected ~ I do like it! The background is my hand-dyed wool ~ my dying is pretty unorthodox and sometimes the wool ends up so mottled ~ look what a great varied background it makes!! And the clamshell corners and little flower are from the scrap basket! This is the first chair pad I've hooked ~ I drew the pattern for a student but kind of made a boo-boo so I kept this one for myself and re-drew another. It was something I could re-draw but certainly couldn't sell ~ once it's hooked over, you can't see the crazy re-drawn lines! This sheep body is a combination of wool yardage and a grey wool sweater with some white mixed in. The background is some vintage wool that I overdyed with a wash of black ~ I like the look! This is Karen's first rug finish! She did a great job on her chair pad and brought it to me to bind! She said she wanted to use it before the end of the year and thought it might happen quicker if I did it! I was happy to help and if time allows, I want to make a label for it, too! Another little mat finished by a student ~ remember I had two classes a couple of weeks ago ~ these girls are moving right along and I'm so happy to be able to show their rugs! 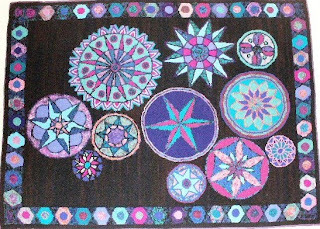 Sally has a new place on Lake Erie and wants to hook with light and bright colors ~ this little star mat will be perfect for her new place. She's hooking high and wide ~ a wonderful first rug! Last but not least ~ look what I have to deal with when I'm hooking!! Mr. Kitty makes himself right at home in the wool pile right where my cutter is!! I cut ~ he sleeps ~ he couldn't be happier ~ my Mr. Kitty! Well, I better end this ~ I have dye pots going ~ office work to do ~ finishing up the laundry ~ and getting organized for the show on Saturday. If you're in the area, don't miss The Gathered Treasures show ~ all the details are in the link at the left ~ Carolyn, Julie and Carol have done a great job at 'gathering' vendors with antiques, folk art and rug hooking! Stop by and say hi! Almost two weeks ago, Heidi and I went to Bowling Green to the Black Swamp Spinners Guild Market Day. What fun that was ~ at least for Heidi and I ~ and a lot of other folks as well. Our rug hooking friend, Kris Miller was there but the rest all were selling yarns, roving, fleece right off the sheep as well as a miriad of other things fiber related. This is some of the bounty I gathered ~ the blue green, yellow and purple pieces are felted roving fabric that has been hand-dyed. I have no idea what I'm going to do with it but it is beautiful to my eyes! The lavender roving falling out of the bag has bits of sparkly stuff and ravelings carded in with it ~ very appealing to me. There are little bags of dyed fleece and small hanks of hand-spun hand-dyed yarn to be used in some artistic hooked piece. I bought a white fleece to wash and dye into various colors and Heidi and I are sharing a small dark brown fleece. I have a show next Saturday here in Mansfield ~ I'm hoping to get some of it washed and ready to sell! I have so much to do between now and then, it makes my head spin!!!! At any rate, we had a great day and will look forward to it next year! I just had to show you this crazy car driven by my friend, Melody ~ of head shaving fame ~ you remember she and our grandsons had their heads shaved a while ago for charity! Well, she came the other day to pick up a stretcher frame that Sonny made for her sheep rug and when I walked out to the car with her ~ here was this crazy set of wheels that Melody just loves! She is a school librarian and on the car are drawn characters from kids books ~ on the door is Swamp somebody (I was going to try to remember her name) and the colors are duct tape! It's much more impressive in person but I just had to share it with you ~ my friend, Melody, is a very unique person ~ she said the kids at school just love her car ~ and I know they love her, too!! This week I hooked a couple of pieces to have for the show, worked outside a while each day, worked in the office each day, drew a couple of rug patterns for customers and color planned a neat fish today for a gal ~ and I could go on and on. I'm heading for my bed now ~ it's 12:38 ~ and I'll check in after the weekend! I hope yours is a good one ~ filled with lots of adventures!! and besides, that ~ I don't like to reverse hook! I think he'll be very happy there! This is Mr. Rabbit's new home ~ in front of two comfy chairs that we almost never sit in! I really hooked it for my side of the bed, so that when I wake up, I have a nice soft rug for my tootsies to land on! For the rug hookers who are reading, I hook high and with a wide cut. Rugs hooked high and wide, especially for the floor, have a lot of substance to them ~ very soft and cushy ~ this rug has lots of substance! This photo shows a couple of elements in the room that made me think Mr. Rabbit could be at home here. 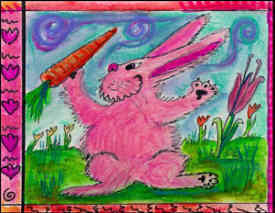 The rabbit pattern is drawn by Margaret Shaw, a painter ~ she also is the artist who painted the cat at the left of this picture. And the wooden folk art rabbit that perches on top of the cabinet, just told me that the rug belonged in here! I love M. Shaw's work (she also goes by that) and her rug hooking patterns are hard to find. She usually is at the summer show at Quailcrest Herb Farm north of Wooster in June ~ I'm going to try to get there and see what she has to offer. Easter weekend was pretty quiet for us, except on Friday night ~ we went to dinner with friends, Kathy and Jim and then we danced the night away to The Traveling Lounge Lizards!! Don't you just love that name? They play music that appeals to people of our age and the guys that play are our age ~ Sonny and I left sometime after midnight ~ the next day we took a walk and watched TV movies and slept the day away!! Party animals ~ that's us! On Sunday, Sonny, Tad and I went to dinner and then headed back to our home. Sonny has been working so hard on this rehab house besides his job ~ I think we just needed some r-and-r ~ now we're back in the swing of things!! Things are greening up ~ daffodils are blooming ~ and the yard work awaits!! I went out for a while yesterday and cut back all the grasses and raked leaves ~ it'll take me a month of Sundays to get done all there is out there! And I have a show to prepare for ~ and a rug trip coming up ~ and a trip to Seattle ~ all before the end of the month!! Hang on ~ it's gonna be a bumpy ride!! Have a great day and enjoy your journey!! These profound words were in an email from friend, Carol ~ seem like good words to live by! Aren't these beautiful fabrics? Artist, Glennis Dolce, creates bits and pieces of fabric with indigo dyes ~ they are intriguing to me ~ they captivate my attention! Her friend, Jude Hill of Spirit Cloth, stitches very creative little story quilts with this fabric and sells them on her website. Jude had a link on her Facebook page a couple of weeks ago to let readers know that Glennis had some 'boro packs' to sell! Yippee!! I ordered and shortly they arrived! Don't know what I will make with all these gorgeous blues but you'll see it when I dream it up! Last summer, at the Sauder Village rug class, there was a very sweet woman who sat next to me ~ Aryl ~ pronounced like Carl (she always said that!)! This was the rug she began there ~ the pattern is Barn Symbol Galaxy by Bea Brock ~ one I thought I wanted to tackle sometime. Aryl emailed this to me and it really is just so pretty ~ gorgeous dramatic colors and hooked so well. I asked all the gals in the class to send pix of their finished rugs and I would post them here on the old blog ~ thank you, Aryl pronounced like Carl ~ I so appreciate being able to show off your beautiful creation! Yesterday, I got the gray hairs colored ~ it looks ever so much better! Then, I had a really nice lunch with my great nephew, Louie, who is heading off to Las Vegas this weekend to find his fortune! He's a young musician who's made a connection way out there ~ I wish him the very best and sent him off with one of my favorite books "The Secret"! It's about abundance and the Law of Attraction and if nothing else, it will give him something to read on the plane and maybe something to enhance his young life! The tax prep is finished!! Yay!! I'm heading to the accountant as soon as this post is done ~ something I can finally tick off 'The List' ~ my list is sooo huge ~ you just wouldn't even believe it! My friend, Melody, is coming this afternoon to pick up a stretcher frame for the sheep rug I hooked for her last year. And tonite our friend, Rita, is taking us out for my birthday!!! In between, I'll do laundry, work on bills and the weather is finally nice here, so I should go out and clean the leaves off the daffodils that are getting ready to bloom!! Mama's work is never done!! I hope your work gets done and that you are able to enjoy SPRING!!!!!!!! Ta ta for now!